Home » Blog » HEPA » HEPA Blog: Can you make every week National Careers Week? HEPA Blog: Can you make every week National Careers Week? Part of our series of blogs from our Higher Education Progression Advisers. 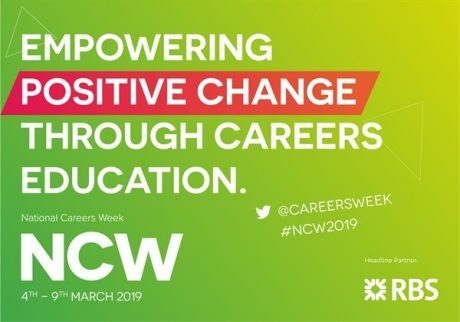 National Careers Week (NCW) takes place in March every year – for 2019 it is happening between 4th and 9th March. It’s also National Apprenticeship Week! National Apprenticeship Week will look to involve more individuals, employers, partners and providers in activities that highlight the benefits apprenticeships bring to employers and the opportunities apprenticeships present to individuals. National Careers Week is a celebration of careers guidance and free resources in education across the UK. The aim is to provide a focus for careers guidance activity at an important point in the academic calendar to help support young people leaving education and planning their futures. With employers still saying that young people are ill prepared with the basic skills needed for employment, there has never been a more need for careers guidance to be promoted and celebrated in education. National Careers Week is a great platform to inform and inspire the next generation as they enter the world of work. It’s also a good way of contributing to some of the Gatsby Benchmarks – including Learning from Careers and Labour Market Information (LMI) – (Benchmark 2) and Linking Curriculum Learning to Careers – (Benchmark 4). If you can encourage employers and providers into your school it can also contribute to BM 5 and possibly 6 and 7 too. Each school or college should recognise that the reach of subject teaching is far reaching than what can be achieved through a few careers education sessions. Schools should adopt a strategic approach to linking curriculum learning to careers and develops a coherent rationale for embedding careers in subject learning. Identify some enthusiastic teachers to work as curriculum champions and as a springboard to develop some materials for their departments. For NCW, have a different focus for each day – such as Sciences/STEM, Humanities, Languages, Art and Design and so on. You could also use themes such as self-employment and sustainable/green economy/community projects for something a bit different and could work across the whole school if you feel like being a bit more ambitious! Encourage all members of staff to complete a sheet saying what other jobs they have done.. maybe offer a prize for the most unusual job! Form a display of ‘guess who’ about members of staff based on their work history – prize by the end of NC week for the most correct answers. Within subject lessons encourage research linked to the world of work – who can find the most jobs linked to a particular sector? Or describe some job roles and students have to research to guess what they are. As well as number of careers, use a subject lesson to explore different skills that are acquired by studying that subject. For some subjects (such as Drama) students could act out job roles or be allocated a career and members of the class have to guess them. This could be filmed to create resources for subsequent lessons, content for school/college website, parent events and so on. Develop a monthly schedule of involvement as a follow up to NCW – this can be as basic as a display for each department. This will be more effective if SLT endorse this. Use alumni to track different subjects/sectors that ex-students have studied/started a career in a certain sector. Use anything you have from previous years and remember to keep good ideas and materials for next year! These are only a few ideas – what else can you think of? Also, remember to record any evidence to inform your Compass self-evaluation. HeppSY+ is here to help! Your link Higher Education Progression Adviser (HEPA) can advise on the Gatsby Benchmarks and how to help meet them – Please get in touch with your HEPA or School/College Programme Manager to find out more about how we can help you. https://nationalcareersweek.com/ncw2018-careers-ed-booklet/ Find resources here to help make every week a careers week in your school/college. https://www.careersandenterprise.co.uk/research/careers-curriculum-what-works – link to a Careers and Enterprise Company publication about maximising careers in the curriculum opportunities.